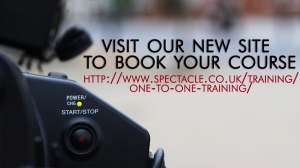 Spectacle can offer one to one tutorials by appointment on any aspect of your production or post production process. From this, we can offer on-going support while you work on your film project. It is easy to find courses that teach you how to operate cameras and use Final Cut Pro software, but there is more to filmmaking than just learning how to use equipment and software. This is a hybrid course; part training, part mentoring, part technical support, part consultancy- tailored to your personal needs. Work on your own film project as you learn. You can even work on your own laptop. Flexibilty: You can book sessions by the hour as and when you need them. As many or as few as you need. Get the advice you need when you need it. We can also offer a data back up service. Advice on shooting to edit, suitable filming equipment, technical concerns, editing, organising post production, budgeting, use of archives, research, copyrights, mutlicamera shoots, sound recording, use of sound. work flows, codecs, uploading on-line, buying equipment- Any thing you want to cover that helps you on your project. By appointment. Weekdays, evenings and weekends are all possible. Contact us describing your project and your training requirements.